My husband and I have been wanting to plan regular one-on-one dates with the girls for a while now. We love doing things as a family, but having some “just me and you” time is really special, too. With that in mind, we decided to give the girls a Year of Dates for Christmas this year – an envelope for each month, with a special surprise date inside. We brainstormed date ideas and came up with a variety of fun activities. Some are outings, while some are doing projects at home. We also tried to keep them fairly inexpensive. Shop for and cook a recipe of your choice. Choose a craft or sewing project for us to do together. Go to the bookstore for a new book and a treat. Go out to dinner at a restaurant of your choice. Go shopping for a new outfit. Do a woodworking project together. Go out to breakfast at a restaurant of your choice. Have a movie night – at home or at the theater. Go bowling or miniature golfing. We made two sets of coupons and divided them up into envelopes for each month. The girls will get to open their envelope at the beginning of the month to find out their surprise date! They will alternate having one-on-one dates with mom or dad. I’m pretty happy to be giving the girls the gift of our time and attention – this is definitely one of those gifts that keeps on giving. We can’t wait to give them their coupons – I hope they are as excited as we are! I’m thinking we should make a little scrapbook of our dates for the whole year – wouldn’t that be fun? 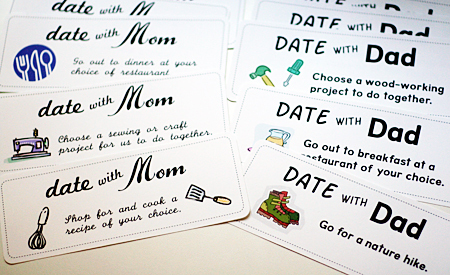 Update: Download and print our Parent & Child Date Coupons! 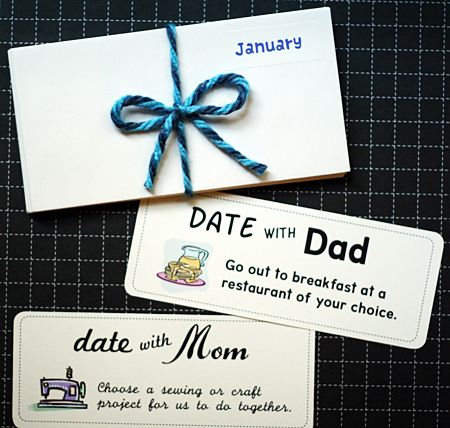 I added 2 pages of blank coupons to the download so you can create your own dates, too. Enjoy! Are you giving any experience-type gifts this year? Do you think your kids would enjoy a Year of Dates? I love this idea so much. We have 2 girls too and they are always wanting special time with me and hubby. I hope you don’t mind me asking but is there any chance you can share these coupons as a download. That will be really awesome. Thanks. LOVE this idea for my 6yo! Would you be willing to share the coupons so we could download?! Thanks for sharing your idea! I love it. Definitely a MUST for this Christmas. Thanks again! Okay, friends – you can now download and print our coupons! :) There’s a link at the end of the post. Hope you and your kids have a great time with your own year of dates! Thank Amy! Great idea and an easy one to add to the stocking or under the tree. This is fantastic! Thank you for the download!! Absolutely!!! Thanks for sharing! We have a child that is particularly hard to buy for and all she ever wants is one on one time with us. I will be printing these for sure and giving them to her for Christmas. Thanks soooo much!! Love this idea! Such a special way to make time to spend with your kids. What a FABULOUS idea, I have just printed these and will DEF be giving them to my daughter as a Christmas gift!!! THANK YOU THANK YOU THANK YOU for sharing such a wonderful idea w/ us!! Thank you for sharing this!! I just printed them. Thank you so much for sharing your hard work and allowing us to download them! Merry Christmas! Just saw this via Ladybug Limited on Pinterest – it’s utterly fabulous. I’m now trying to figure out how I can make time to make these so we can make time together! Thanks, everyone, for your kind words! It makes my heart so happy to know that you will be joining our family in a Year of Dates and enjoying some very special one-on-one time with your kids. By the way, if you don’t have time to make these for Christmas, they would be a great New Year’s or birthday gift, too. Thank you for making it easy for me to get this done this year! Awesome ideas and great cards. I love this! We’ve been trying to have more “dates” with our girls, and this will make it even more fun and special. Thanks for providing the printables! lovely idea, going to use this. thanks! Thanks so much for sharing your coupons!! I can’t wait to try this with my 2 boys! We have been giving coupon gifts for years now and our kids love them. We have 3 kids and they get 10 each. We cover our Christmas tree with them and they enjoy finding their own cards on the branches. Our coupons are not just for time with us, but some are also for adventures they will enjoy. Our daughter is taking a cooking class in a baking school and we promised them each swimming lessons and a fun family vacation. The rest are dates with us, family outings, and projects we can do together. It is a great tradition. This sounds like an amazing tradition, Stacey! I love the idea of including special “adventures” that each child would love. So fun! Thank You!!! These are great ideas. I struggle to make one on one time with each of my 3 boys. Since before we had kids I have said that we need to do parent/kid dates. These are perfect- thank you!! I love this!!! I have a 5 and 4 year old little girl and 8 month old baby brother. With the addition of little brother it has been hard to have one on one time with the kids. I think this will definitely help!! Thank you for including the download. Hi Amy, I just wanted to let you know how much I love this idea. I was too busy to do it for Christmas, but I ended up just doing a version of it for Valentine’s Day. I can’t wait to give it to my kids but I know they’ll be thrilled. Thanks so much for the idea ( I linked back to you in my post). A friend shared this with me (she used the certificates as Valentine’s gifts for her kids) and I have printed them for our family! Thank you so much for sharing!! 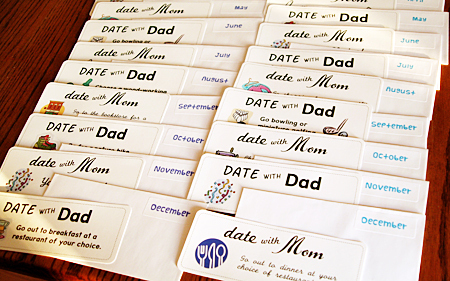 LOVE this idea (including the scrapbook)! I have twin 3.5 year olds and really need to make it a priority to spend one on one time with each one of them. Great post! LOVE this idea! I’m doing this for sure! I think these are just fabulous! What a great idea! I love this idea! My son will finally lose his only-child status after nine years: only a week after his birthday. This will be the perfect birthday gift for him!! I’ve been looking for something I can give/do for him to ease that transition from only child to big brother. Just came across your blog and love this idea. Will be printing out sets of cards for our 3 boys and think they will love getting to spend some time with each of us alone. It’s one thing we struggle to do (now there are 3) is get to spend some one on one time, with 2 we kind of tag teamed but with 3 it’s more of a juggle! Thank you for sharing this. :) How about doing a set for mum & dad date nights too? Making these for both our kiddos this year… so excited! Also, writing an article on dating our kids for our church newsletter and including a link to this post. Thank you for this wonderful idea! We are going to give them to our two boys for Christmas and we know they will be thrilled!! Thanks for this! I’m going to adapt the idea for my little sister. We don’t spend enough time together and I never know what to get her! I just found these today and am going to make them for our daughter for Valentine’s Day! Thanks for sharing the printables! Brilliant Idea for Grandmas too! I’d like to start a blog so I can easily share my personal experience and feelings online. Please let me know if you have any kind of ideas or tips for new aspiring bloggers. Thankyou! Love this idea! This is really manageable for a 2-child family. Could you give me a suggestion for how to make this work with our 5 children? I look forward to your creative idea!